Here are two resources all athletes should check. The NCAA Eligibility includes information for student athletes and school administrators including a link to the site where all potential student athletes need to register. 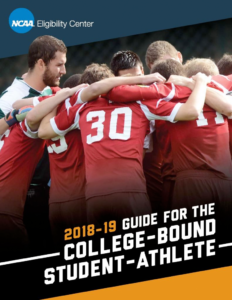 The NCAA Guide has more information that includes expected standards for Division I, II, and III schools, eligibility considerations, and course and grade expectations.